Dozens of British people are still unaccounted for following Saturday's earthquake and resulting avalanches in Nepal, which has left more than 4,000 people dead. The Red Cross initially said 90 Britons were missing, but 30 have since been located. A Royal Air Force (RAF) flight carrying vital UK aid stocks to the affected areas, along with a team of around 15 Gurkhas, has left for Nepal. The Gurkhas, Nepalese soldiers who have been part of the British Army for almost 200 years, are flying in a RAF C-17 aircraft loaded with vital emergency supplies, including more than 1,100 shelter kits and 1,700 solar lanterns. The Foreign Office is now investigating claims that a British national, who is residing outside the UK, was killed by the Nepalese earthquake, Foreign Secretary Philip Hammond has said. Hammond added: “We’ve got a British Army Gurkha team, as you know, that was on Everest that is continuing to trek down the mountain and identifying and reporting British Nationals on the way as they go. We’ve also got Gurkhas from the Gurkha Training Base in Nepal who are assisting the local authorities." The Gurkhas will join search-and-rescue teams on the ground in the Himalayas. 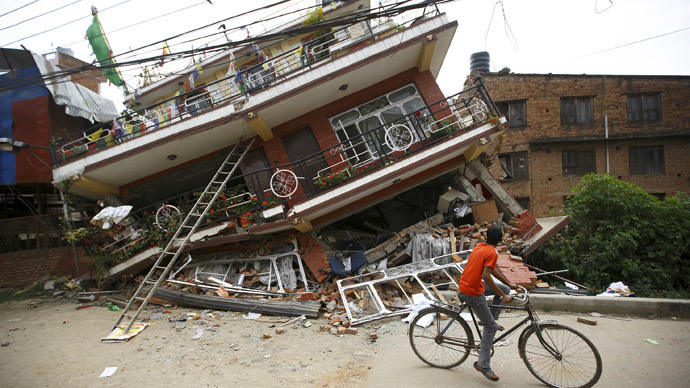 On Tuesday morning, the death toll in Nepal stood at 4,352, according to Nepal’s Home Ministry. Another 72 people died in India and 25 people died in China. Eighteen people were killed in avalanches on Mount Everest. Aside from the team of Gurkhas on their way to Kathmandu, the UK already has “some UK personnel in on other flights and there are 60 British personnel, search and rescue teams and other experts already on the ground delivering assistance. We’ll hold a COBR meeting tomorrow, which I will chair to take stock of where we are and to look at further assistance needs of the Nepalese government,” Hammond said. Nepal’s Prime Minister Sushil Koirala warned the toll could reach 10,000, Reuters reports. At least 7,000 have been injured in the worst disaster in Nepal in 80 years.International Development Secretary Justine Greening said the UK government would match the first £5 million made in public donations. As many villages in higher regions remain cut off, it is unclear how many people have been affected by landslides and falling rocks. Whole villages have potentially been flattened by the earthquake and survivors may be in desperate need of aid. With shortages of water, food and electricity, disease has become a major concern. Bodies have been piled up at roadsides and a series of mass cremations have taken place next to the Bagmati River, which divides Kathmandu. British newlyweds Alex Schneider and Sam Chappatte, 28, were among climbers stranded at the Mount Everest base camp. On their blog, they wrote: “We staggered out (of the tent) to see an avalanche coming straight at us. “A blast of wind knocked us down but we were able to get up and run to shelter behind some tents and anchor ourselves with our axes. Medical workers and NGOs are pouring into Nepal to help with the relief effort. Kathmandu airport is struggling to accommodate all incoming aid flights as doctors, rescue workers and disaster response teams arrive from across the globe. As hundreds of foreigners are still missing, Google and Facebook have launched emergency tools to help track and find people who are unaccounted for. Goolge’s Person Finder was also used to find people during the 2010 Haiti earthquake and the 2011 Japanese earthquake. Facebook’s Safety Check tool also helps people get updates on their loved ones in affected areas. No British tourists are known to have been killed, but hundreds were in Nepal when the earthquake struck. Dozens still remain unaccounted for. UK tour operators are canceling trips to Nepal and the Foreign Office is advising against all but essential travel to the country. Nepal is a popular destination for adventurers. The climbing season begins in spring each year. Intrepid, an adventure travel company, has canceled all its trips to Nepal until May 11. It said all its 168 customers who were in Nepal over the weekend are safe and accounted for, and their safe return is being arranged.